Interesting on building up a home network? Ok! I now assuming you have DSL/Cable connection at home, then you wish to share internet connection with other computers. The most common home network is Ethernet, it’s a very popular LAN (Local Area Network) technology due to it’s inexpensive setup cost and reasonably fast speed. The other types of network are Token Ring, LocalTalk, and FDDI, but it’s not important here. The speed (data transfer rate) of an Ethernet can be 10Mbps (Ethernet), 100Mbps (Fast Ethernet) and 1000Mbps (Gigabit Ethernet). Mbps is called Megabits per seconds. From my opinion, 100Mbps speed might be sufficient for your network needs. There is one rule here, make sure all your network devices (router, network card, switch, hub, network cable) are able to support the network with particular speed (10Mbps, 100Mbps, 1000Mbps) which you plan to set up. If you plan to set up a Gigabit Ethernet, although you have 100Mbps' network card, but your router can only support 100Mbps, then the network speed would be 100Mbps. Here is typical network topology. 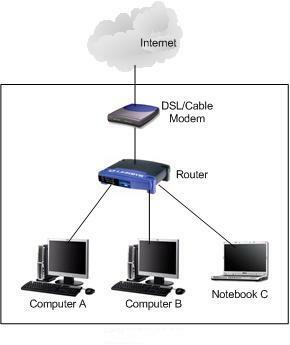 Router is the most important device in the network for sharing internet connection with other computers and to route network traffic to Internet. Usually there are 4 Ethernet ports available on router for connecting to computers at home, however you can use switch to expand your network in future . If you mainly want to connect 2 computers, you can use crossover cable to connect 2 computers directly. Ok! Now you should proceed to read about preparation on setting up home network.